"The ultimate spy novel: engrossing, shocking, and dangerously exhilarating!" Ya'ara Stein, at thirty-four, intended to finish her BA in filmmaking but a pressing call from the Israeli Prime Minister put a hold on her education. She is to establish a small, ultra-secret team of covert agents that will answer only to the PM. The team members and the methods to be used are left entirely to Ya'ara; she has carte blanche to use any means necessary to ensure the success of her operations -- legal or not. Her recruits, four women and two men, are doing well, but their training is cut short when Ya'ara receives a call from her friend and occasional colleague Matthias Geller, a German Intelligence service senior officer. Matthias' much younger girlfriend Martina dumped him recently and she has apparently vanished from the face of the earth, and he has a feeling that something is off. Ya'ara gathers her team: their training will continue in the field. Maybe there's nothing to Martina's disappearance, or maybe all hell will break loose. Those who have read the astounding�TRAITOR� will remember Ya'ara and Matthias; Aslan is also a member of the team, and two other characters from Jonathan de Shalit's debut novel also play brief but pivotal roles. A SPY IN EXILE is a book for the true spy thriller aficionado where much takes place watching in the shadows and plotting quietly in dark corners until it's time for action. I can hardly remember when I have held my breath so much, when I have been at the same time elated, shocked, horrified, stunned so much by what happens. One cannot help but wonder at all times: what is true and what is fiction because it's all so terrifyingly plausible. The icing on the cake is again Mr. de Shalit's exceptional storytelling skills, his highly evocative prose as he paints a vivid picture the physical environment, of the unpredictable and mesmerizing world, inhabited by dedicated men and women, some of whom are willing to do literally anything to achieve their goals. A SPY IN EXILE is so intense, so flawlessly plotted, and has such unexpected twists that I had to read the second half uninterrupted, and I suggest you do the same because there is just no way to stop at that moment. I am already eagerly anticipating Mr. de Shalit's next book; it's been ages since I have read such a powerful novel. I must also mention Mr. Steve Cohen's flawless translation. Jonathan de Shalit had set the bar extremely high for himself with TRAITOR�, and he cleared it with a lot of room to spare in A SPY IN EXILE. From the author of the internationally bestselling �supremely effective, cunningly crafted� (The Providence Journal) thriller Traitor, a cerebral and suspenseful novel of high-stakes intrigue in Israel�s top intelligence agency. 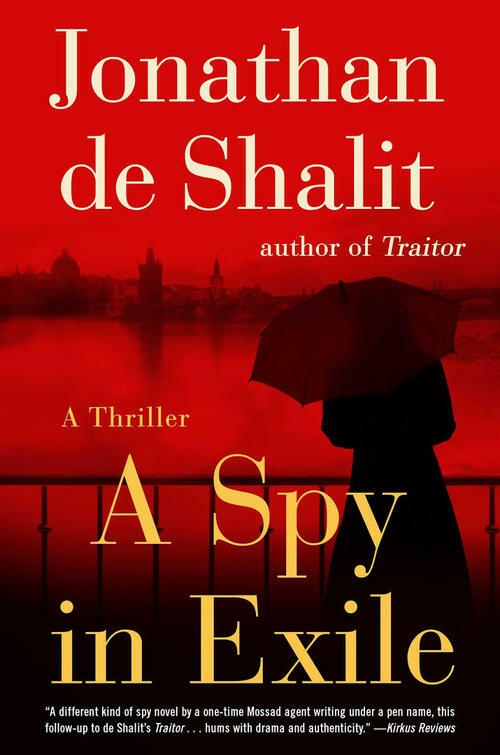 After Ya�ara Stein is forced out of her job at the Mossad �the secret intelligence service of Israel�she is called upon by the Prime Minister for a classified job. Known for her aptitude, beauty, and deadliness, Stein is asked to set up a secret unit that will act independently, answerable only to the Prime Minister. This streamlined and deadly unit, filled with bright young men and women recruited and trained by Stein, quickly faces threats both old and new. Descendants of the lethal militant Red Army Faction have returned to terrorize Europe and fears of a radical Islam splinter group force the unit to distinguish between facts and smoke screens. As Stein�s cadets struggle to crush these threats, they soon discover how easily the hunter can becomethe hunted. A dazzling, tension-filled novel that sheds light on the world hidden just below the surface of our everyday lives, this thriller offers a peek into the dark behind the curtain where today�s deadliest conflicts are fought. With breathless pacing and shocking twists and turns, it proves that Jonathan de Shalit �has learned well from the likes of Mr. le Carr� (The Wall Street Journal).